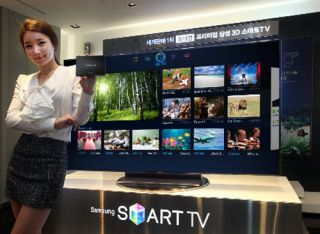 Samsung introduces Evolution Kit to upgrade smart TVs | What Hi-Fi? There's nothing more annoying than having recently bought a new TV, then discovering that it's already obsolete as the replacement models are revealed. We expect to see a rash of new models at CES 2013 next week, but if you bought a Samsung 7000, 8000 or 9000 smart TV in 2012, worry not. The Korean giant has just unveiled its Evolution Kit, designed to upgrade its 2012 sets to the spec of the forthcoming 2013 models. By simply plugging the Evolution Kit into the back of the TV, owners can enjoy the benefits of the newest Samsung TVs. These include hardware enhancements such as CPU, memory and GPU upgrades so users can get faster internet browing speeds, and multitasking capability for using apps while watching TV at the same time. There are also improvements to Samsung's smart interaction features such as voice and motion control. The Smart Hub is also upgraded to the 2013 spec. Robert King, vice-president of consumer electronics, Samsung UK and Ireland, says: "The Evolution Kit is a truly innovative concept that allows consumers to enjoy the latest features and services every year without having to purchase a brand-new TV." We will be reporting live from the Samsung stand at CES 2013 in Las Vegas next week with details of all the company's new models. In the meantime, check out our dedicated CES 2013 blog for a sneak preview of what's in store at the biggest tech show on earth.